McRaven’s column is notable because he is a bona fide war hero—the man who oversaw the raid that killed Osama bin Laden—and has not served in a politically appointed position. Petraeus was also a war hero, leading U.S. forces in Iraq and Afghanistan before becoming the CIA director. He was eventually forced to step down for sharing classified information with a woman with whom he was having an affair, but he’s retained a sheen of respect and credibility in national-security circles. He has gone out of his way to avoid criticizing the president, and was considered as secretary of state at the outset of the Trump administration. For Gates and Petraeus to move off the sidelines—and in Petraeus’s case, to likely slam shut the door to an administration job that he has diligently kept open for so long—shows how Trump’s attack on Brennan could backfire. 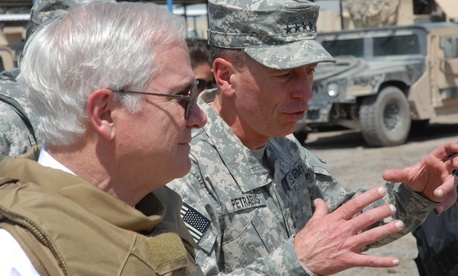 (Petraeus might say it’s an example of how insurgencies grow.) Perhaps Trump thought that by starting his clearance purge with Brennan, he might avoid too much flak: Brennan has plenty of detractors, on both the left and the right. Instead, Brennan’s former colleagues have closed ranks, while even some of his critics have taken issue with Trump’s move. As usual, the question with any Trump-related headline is: Does it matter? For one thing, nothing seems to significantly shift the political needle. Beyond that, Trump has gone after war heroes, most notably Senator John McCain, in the past and survived. McRaven, Gates, and Petraeus aren’t household names outside of Washington. Besides, the trouble with a reputation for being above the fray is that you only have one or two chances to intervene in messy political fights before you lose the reputation. (Part of Trump’s political genius has been his ability to make everyone else fight like him—dirty—thus tarnishing them as well.) Michael Morrell, a former deputy director of the CIA, has lamented the way critics within the intelligence community have eroded its reputation for independence and made it a political player; nonetheless, Morrell signed Thursday’s letter in support of Brennan. Even without the ability to mobilize vast public shifts, there are two ways the McRaven and group of 13 letters could matter. The first is that having figures like Petraeus and Gates speak out gives encouragement and cover to other would-be critics of the president, telling them they’re doing the right, and nonpolitical, thing. Now Trump is fighting wars on several fronts—against Manigault-Newman; against practically the entire former leadership of the intelligence community; and, of course, against Special Counsel Robert Mueller, whose team rested its case against the former Trump campaign chair Paul Manafort this week. Trump remains remarkably resilient in the face of these troubles, which might have ended another presidency. This is in part because of his famously steadfast base. Yet that base is a small portion of the electorate, and, if anything, it is shrinking. Because Trump is perpetually on the defensive, he’s unable (or unwilling) to take any steps that might expand his appeal and his coalition. The president’s decision to launch his latest war of choice risks bogging him down in yet another unwinnable quagmire. It’s a danger that the intelligence chiefs, perhaps better than anyone else in the world, could have predicted.